Journalist Daphne Caruana Galizia, who was killed by a car-bomb in Bidnija almost three weeks ago, was given a final farewell at an emotional funeral held at Mosta Church this afternoon. However, the congregation did not include The President, the Prime Minister and the Leader of the Opposition because the family expressed the desire that the three do not attend the funeral. In his homily, Archbishop Charles J. Scicluna expressed a message to her killers that however and wherever they may hide from human justice, they cannot escape God’s justice. At 1.48 pm, to the tolling of funeral bells, her coffin was carried onto the church parvis, her visibly grief-stricken husband and three sons following the coffin to applause, an applause that was not only audible on the parvis but carried on for ten minutes from the surrounding areas from the crowds present around the church. With photographers and cameramen respecting the family’s decision not to take pictures or film inside the church, Archbishop Scicluna delivered a short homily in which he directly addressed the assassins, journalists, the people and Daphne caruana Galizia’s children. Whilst imploring God to have mercy on her soul, the Archbishop said that although up to now it is not known who killed a mother and a journalist, they should repent before it is too late for them to do so. He warned them they may escape man’s justice but they will not escape God’s justice. Archbishop Scicluna said that journalists are needed by society and he called on them not to be afraid and to continue in their role as the eyes, ears and lips of the people, without fear but with showing full respect to the truth. He said society needs journalists who are free, intelligent, inquisitive, honest, tranquil and protected. While consoling Caruana Galizia’s children, the Archbishop called on them to be the children of light. He said their mother had experienced a cruel death from a hidden hand that sought darkness rather than light because the scope of the killers had been evil. Addressing the people, Archbishop Scicluna urged them not to be afraid and he expressed his wish that exchanges of insults and disrespect should not continue. He ended his homily by quoting verses from the Maltese national anthem “Ħares, Mulej, lil din l-art ħelwa kif dejjem int ħarist” (God, safeguard this sweet land as you have always safeguarded her”) and said may it continue to enjoy true liberty in prosperity and solidarity. At the family’s expressed wishes, the funeral was not attended by the President, the Prime Minister and the Leader of the Opposition but was attended by the President of the EU Parliament Antonio Tajani, OSCE representatives of media freedom, former Prime Minister Lawrence Gonzi and former Leader of the Opposition Simon Busuttil as well as Chief Justice Silvio Camilleri. As the coffin was carried out of the church into the funeral hearse for the final journey and a private burial, there was great applause and cries of “justice” and “Daphne”. 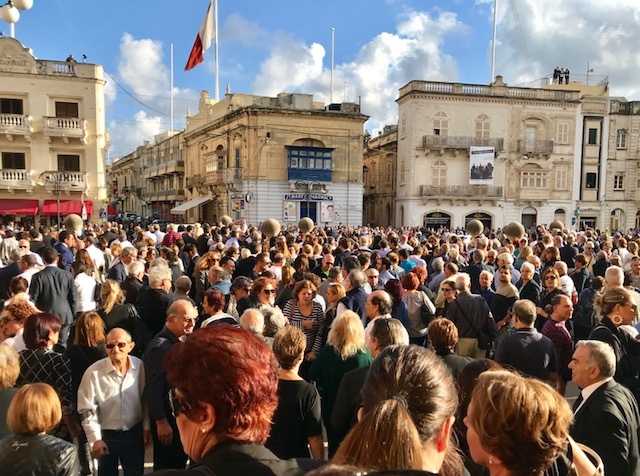 The funeral took place on the day of the Government’s declared Day of National Mourning with flags raised at half-mast on the Presidential Palace, the Prime Minister’s Office and other public buildings as a sign of respect for Daphne Caruana Galizia.